Envy Scooters - by Andrea Francolini Photography, 2014. Thirty years ago at a crossroads Barry Cuneo took the sensible parent-pleasing option and pursued a career, believing he could drop back into sailing any time. He’s on the water all the time as a sea pilot on Port Philip, but when it came to sailing he discovered a large hole in the sport. At 48 he made a return and now the long-time Royal Queensland Yacht Squadron member and sponsor is plugging that hole for a bunch of rising stars. In return for providing and sponsoring a Melges 32 for the class’ upcoming world championship, RQYS has lent their club coach, three-time Olympic coach Adrian Finglas. In turn Finglas rang a couple of the maestros – Rob Brown and Grant Wharington – to help mentor four eager RQYS crew on their way to the world title via Audi Hamilton Island Race Week, the annual regatta in the Whitsundays that has drawn a 182-boat fleet this year. The youngest on Envy Scooters is 16 year-old Charlie Wyatt, the current Australian 29er champion. Will Bates and Klaus Lorenze are both 18 and from the Queensland Academy of Sport. Lorenze was sailing Optimists until he outgrew the tiny dinghy. Now he can lift one under each arm. Matt Parrott, 21, is a Queensland match racing champion and the boat captain. Rob Brown was part of the winning Australian America’s Cup crew in 1983 and is a three-time 18 foot skiff world champion. Grant Wharington is a highly experienced yachtsman and Rolex Sydney Hobart veteran. For Race Week Wharington or ‘Wharo’ as he’s best known, is on trim, Brownie looks after tactics and Adrian is mainsheet hand and coach. The four together in front of a new adoring audience are a non-stop comedy routine. “I let the jib off when they remind me. They have to speak up so I can hear,” jokes Brown. “These guys are seriously lucky to have the depth of knowledge of Grant, Rob and Adrian,” says Cuneo who is from a well-known Queensland sailing family. His dad Tom is a former Australian 16ft skiff champion and uncle John was a sailing gold medallist at the Munich Olympic Games in 1972. 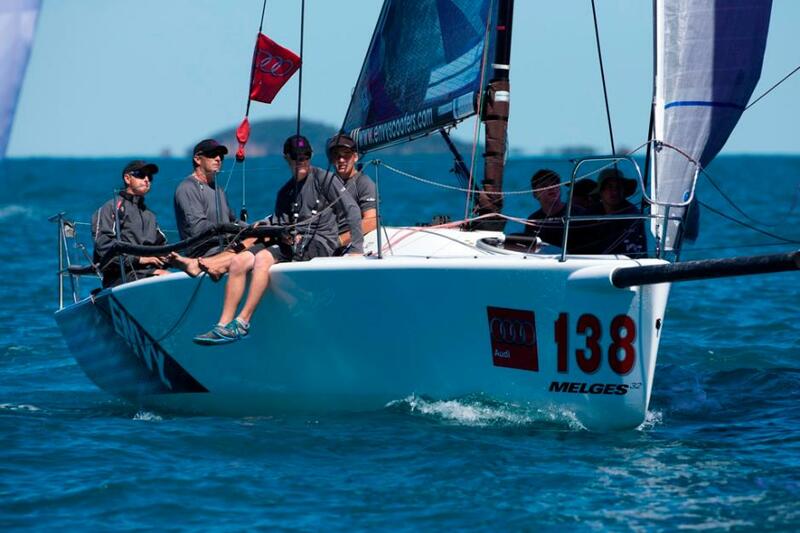 At the midway point of Audi Hamilton Island Race Week Envy Scooters is the lead Melges 32 in their pointscore after six races. Stephen O’Rourke’s Panther is two points from the clubhouse leader and John McDougall’s Goodgear Mac 2 third. The last three windward/leewards were ticked off in quick succession yesterday, Tuesday August 19, 2014, in the ideal 10-12 knot sou’east breeze at Turtle Bay to the east of Hamilton Island. Today, Wednesday 20th is a layday. 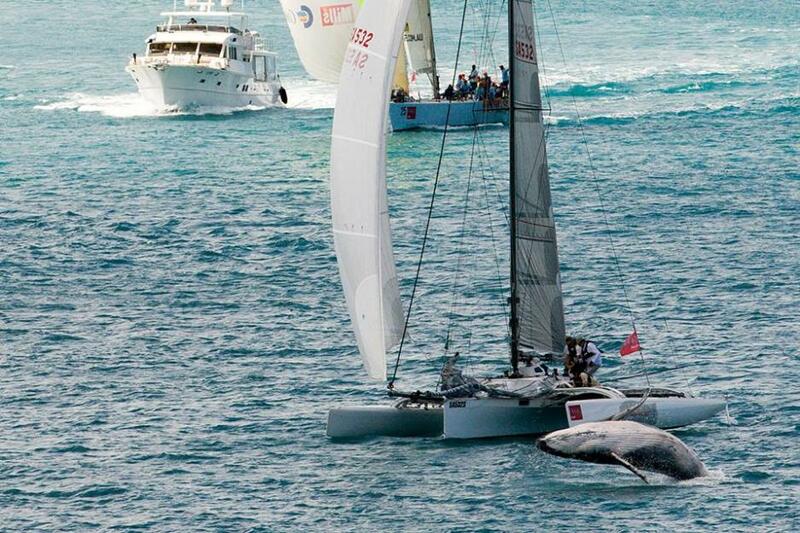 From December 1st -7th in Miami the Envy Scooter crew will take on the world’s best in a chartered Melges 32. Carbon Credit - calf leaping - by Andrea Francolini Photography, 2014. 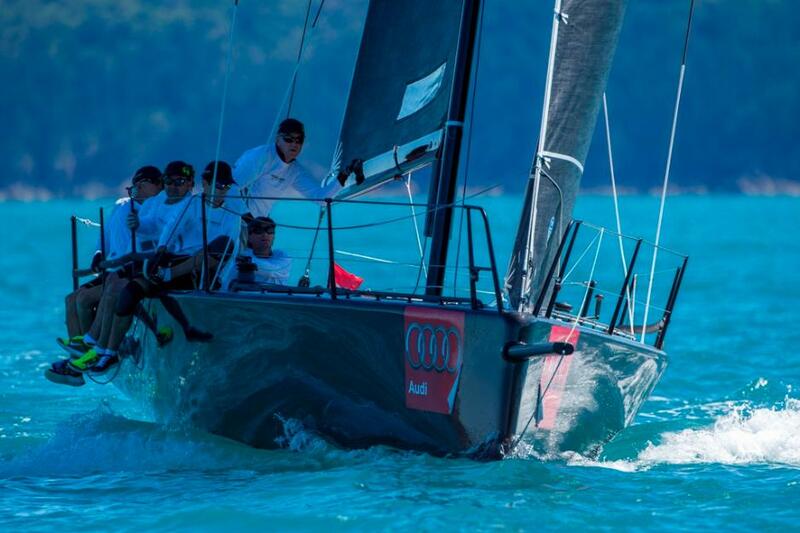 The best of winter sailing in the Whitsundays capped off racing at Audi Hamilton Island Race Week. Bucket loads of sunshine and puffy 18-20 knots of SSE tradewinds farewelled the fleet from Dent Passage for the final time this series. “We had persistent winds this week, no matter how strong or weak there were no car parks,” said Kwok. "Yesterday was the best, a cracker breeze to claim the series; luckily we did,” said skipper Matt Owen. “None of us sail on this boat regularly, just one regatta a year. We saw almost 20 knots of wind yesterday, which was a little bit scary for us with big waves and whales about. We've had a reasonable record at Race Week; in 2010 we won our division and walked away with an Audi as well. Newcastle based Beneteau 40.7 Schouten Passage campaigned by the Howard family finished up second on the points table and Andy Kearnan’s Summit 35 L'Altra Donna third in the six race series. Hamilton Island CEO Glenn Bourke oversaw the smooth running of the 31st edition of one of Australia’s premier yachting regattas, commentated for Audi’s guests and raced part of the week aboard Bob Oatley’s supermaxi Wild Oats XI in IRC division 1. Images by Andrea Francolini Photography, 2014.